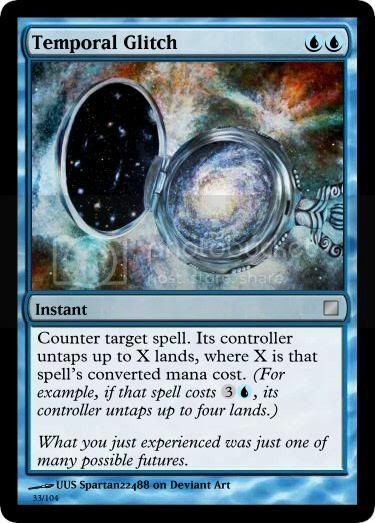 Welcome to M13 Trajectories, where I discuss cards from the files of our fan M13 set and how they changed through input from multiple people. Welcome to M13 Trajectories, where I discuss how card designs from our virtual M13 project have changed through the hands of multiple people. Bond isn't actually doing anything in the set?? This is going to be hard to playtest...!! Here are the details of what I mean. It's been a while since I suggested looking for a new planeswalker to potentially replace Elspeth, Knight-Errant in M13. While we didn't find a complete solution last time, I wanted to highlight some of the more applicable ideas to see if one more pass doesn't do the trick. The biggest problem we had was sticking to ideas appropriate to the core set. White. Core. Planeswalker. These are the unyielding requirements for this design hole. 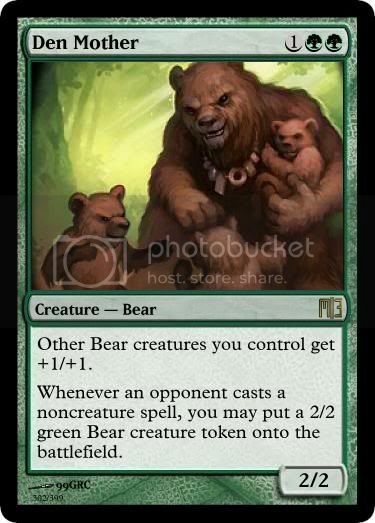 As many of this blog's viewers may know, we've been designing a fan M13 set for several months now. While individual design members have been playtesting the cards with their local playgroups, we have not been playtesting as a group during design. Now, we've established a way to play online and a development team is slowly coming together. The deadline for our fan M13 project is midnight, May 29th, and we only have slightly over a month to make this a polished set that is fun to play and is reasonable as a real set. I'd like to discuss the things that need to be done to make this happen. Before I continue I would like to mention that this project started out on the basis of open participation and it still is an open participation project. 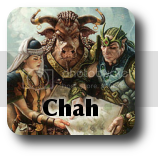 Although there will be a development team to make decisions, anyone is welcome to make suggestions and design cards (that they don't mind us using and presenting to WotC), or help out in playtesting. Hello. My name is Griselbrand. Let's play a little game, you and I. If you win, there will be a reward. Great power shall be granted. If you lose, your soul is mine. Sound fair? Good. Here are the rules. Before you is an altar holding ten chalices. We each take turns drinking a number of chalices, starting from the left. You can choose to drink up to three per turn, and you must always drink at least one. Be careful of the last chalice on the lower right, though. It is — let us say — very special. The one who drinks the last chalice shall lose the game. You shall be the one to start. Now, drink! There are 10 chalices in front of you. You drain one chalice. There are nine chalices left. Griselbrand drains one of the remaining chalices, leaving you with eight chalices. Now there are 8 chalices left. You drain one chalice. There are seven chalices left. Griselbrand drains two of the remaining chalices, leaving you with five chalices. Somehow, you feel that there's a malicious twinkle in his eye. There are 5 chalices remaining on the altar. You drain one chalice. There are four chalices left. Griselbrand grins a huge grin and drains three of the remaining chalices, leaving you with only one chalice. As you may have expected, the last chalice begins to glow with an ominous dark aura, revealing itself to be the Chalice of Death. The powerful demon is watching on with cold but excited eyes and a cruel grin on his face. It's as if the demon is controlling your will. You can't help but move your hands to drink the cup. As your hand grasps the chalice, suddenly you hear a voice. "I've been looking for you, Griselbrand." Both of you turn around to face a young woman shrouded in dark clothes. Her face is covered with a veil, but underneath it you can see arcane runic patterns writhing on her face. Her hands start to emit tendrils of dark energy that turn into a violent black vortex swirling around her. Griselbrand begins to roar something incomprehensible, starting with "YOOOUUUUUU!!!!" But the dark energy from the woman blasts the demon before he is allowed to finish. 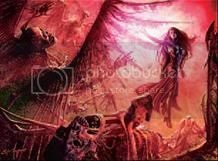 The demon disintegrates into a disgusting pile of bone shards, pieces of flesh, and dark bile. Then it disintegrates further into ash-like dust, which finally turn into tiny floating orbs of black mana before trailing off and fading away. "Yes! Thank you! You totally saved my life!" you shout to the woman. But her eyes are glowing strangely and aren't registering you at all. She seems to be lost in a destructive trance, reveling in her power. You watch in horror as the dark vortex around her keeps growing wider and wider, until it engulfs you too. You drain two chalices. There are three chalices left. Griselbrand grins a huge grin and drains two of the remaining chalices, leaving you with only one chalice. You drink from 3 chalices. There are only two chalices left. 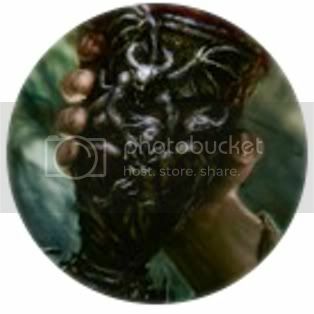 Griselbrand grins a huge grin and drains one of the remaining chalices, leaving you with only one chalice. You drain two chalices. There are six chalices left. Griselbrand drains one of the remaining chalices, leaving you with five chalices. Somehow, you feel that there's a malicious twinkle in his eye. You drain three chalices. There are five chalices left. Griselbrand drains one of the remaining chalices, leaving you with four chalices. You drain one chalice. There are three chalices left. You drain two chalices. There are only two chalices left. Griselbrand grins a huge grin and drains one chalice of the remaining chalices, leaving you with only one chalice. You drain three chalices. There is only one chalice left. "Your turn," you say to Griselbrand. The final chalice glows with a dark and ominous aura on the altar. As you may have expected, it has turned into the Chalice of Death. On the other side, Griselbrand stands brooding with his hands on the altar, staring long and hard at the chalice, his face stern and expressionless. Then he looks up. Rather than a look of defeat, his face has broken into a nasty grin. "You have won this game. Now, as I have promised, there shall be a reward and great power shall be granted... to me!" The demon leaps over the altar between you, knocking aside the final chalice, and pins you down with his club-like hand. His other scythe-shaped hand is poised high, presumably to carve out your heart for some demonic ritual. In a rush of thoughts, it occurs to you that all of the chalices you drank must have been to prepare your body as sacrifice for this ritual. 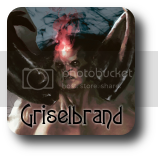 Griselbrand's eyes are almost bulging with voracious eagerness. Then suddenly, his eyes literally bulge. You see that a shining silver spearhead has erupted through his chest, creating a fountain of gushing bile that spatters all over you. Behind him floats an angelic figure silhouetted in the moonlight. Twisting the spear, the figure causes the demon to collapse to the side with a thud. You are able to roll away. Turning back, you see that the fallen demon's body has begun to fade, melting away into wisps of dark energy starting with the limbs. The demon's face, still solid, speaks in a menacing low grumble, "We shall meet again. I won't be away for long." 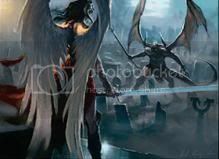 "You won't be away at all," the angel's voice rings as she attaches a silver collar to the demon's neck. Suddenly, the demon's body appears to be bound to this world again. The angel turns to you. She speaks with a piercing voice that seems to ring through space rather than come from any one direction. "Come mortal! Rise! As I have saved you, so you shall save others. We have work to do!" You drain two chalices. There are eight chalices left. Griselbrand drains three of the remaining chalices, leaving you with five chalices. Somehow, you feel that there's a malicious twinkle in his eye. You drain three chalices. There are seven chalices left.